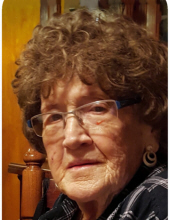 Vera Joseph, 95, of Middletown, passed away Thursday, October 11, 2018, at her home. She was born in Perry County, Kentucky on January 9, 1923 to parents Issac and Sally (Baker) Eversole. Mrs. Joseph is survived by her children, Loriane (Kenneth) Combs, Carolyn Hipsher, Lewis (Sherry) Joseph, Mildred (Gary) Cooper, Reason (Joanna) Joseph, Hardin (Marti) Joseph & Darlene (Earl) Edwards; siblings, Christine, Bob, Paul, Carolyn, Lois, Joyce & Ann; eighteen grandchildren; fifteen great grandchildren; and eight great great grandchildren. She was preceded in death by her husband, Henry Joseph; son, Roy Cole; infant daughter, Edna Joseph; granddaughter, Tonya Joseph; son-in-law, Gene Hipsher; parents; and siblings, Ruth, Gene & Keith. Funeral Service will be held Wednesday, October 17, 2018 at 11:00 am at Wilson-Schramm-Spaulding Funeral Home, 3805 Roosevelt Blvd., Middletown with Reverend James Setser officiating. Visitation will be Tuesday evening from 5:00 - 8:00 pm. Interment will be at Butler County Memorial Park. To send flowers or a remembrance gift to the family of Vera Joseph, please visit our Tribute Store. "Email Address" would like to share the life celebration of Vera Joseph. Click on the "link" to go to share a favorite memory or leave a condolence message for the family.